See Video from the Press Conference – Robert Spencer, Frank Gaffney ! Other speakers will all be uploaded to Youtube November 7. Speakers included Robert Spencer, renowned author and expert on Shariah law, Jihadwatch.org project of the David Horowitz Freedom Center; Frank Gaffney, Center for Security Policy; Dan Pollak for Morton Klein, Zionist Organization of America; Andrea Lafferty, Traditional Values Coalition, and others. Members of the Coalition include Concerned Women for America, ACT for America, Institute for the Study of Islam and Christianity, the Zionist Organization of America, Traditional Values Coalition, Center for Security Policy, Endowment for Middle East Truth, Unity Coalition for Israel, Let Freedom Ring, Christian Solidarity International, Tradition Family & Property Inc., Women United, Jewish Action Alliance, Florida Security Council, Society of Americans for National Existence and the Center for Security Policy- see the full updated list here. We are Americans opposed to the “stealth jihad” being waged in this country by those who promote Shariah – authoritative Islam’s theo-political-religious program for establishing a global theocracy. As such, Shariah and its espousal of violent and stealthy jihad constitute sedition. We are determined to resist efforts now underway to create “parallel” Muslim societies and otherwise to insinuate Shariah into this country via its mosques, prisons, campuses, media, government and financial institutions. Of particular concern is the progress being made to establish Shariah-Compliant Finance (SCF) within Western, and most recently, U.S. banks and other institutions that trade securities. Islamic finance’s leading Shariah authorities have made plain that they consider SCF to be “jihad with money,” “financial jihad” and a means of promoting their objective of destroying the West’s economic system and replacing it with an Islamic one. To this end, the Treasury Department is hosting in its headquarters building on Thursday, November 6th a “seminar for the policy community” entitled “Islamic Finance 101.” This event is being co-sponsored – and, it would appear, orchestrated – to promote Shariah-Compliant Finance by one of America’s leading promoters of the industry: the Islamic Finance Project at Harvard Law School. Harvard has benefitted from the infusion of millions of dollars from a Wahhabi Saudi prince and his government. Such funds are evidently translating into its fealty to the Islamist agenda and the promotion of Shariah and SCF by Harvard professors such as Frank Vogel (who will preside at the Treasury seminar). It is especially alarming that the Treasury Department is now in a position to impose its submission to Shariah on the various financial institutions which it has bought in recent weeks or otherwise controls. With the nationalization of Fannie Mae and Freddie Mac, its purchase of – at last count – 17 banks and the enormous leverage associated with its $700 billion slush-fund, Treasury can be an irresistible force should it actively promote Shariah-Compliant Finance. The fact that Assistant Treasury Secretary Neel Kashkari, the official charged with administering that slush fund, is the host of “Islamic Finance 101” certainly looks like active promotion of Shariah-Compliant Finance. 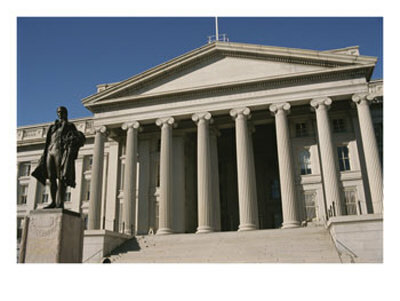 The Coalition to Stop Shariah calls on the Treasury Department to cancel this indoctrination session, to cease its efforts to promote Shariah-Compliant Finance and to recognize Shariah for what it is – sedition – and treat it accordingly by banning its use in U.S. financial institutions and products.